THE CONVERTORUM: Nasty, brutish and tall. Here's a new take on the big guy! Termagant head partly covered in grey stuff hood (chopped off from an old conversion that I never liked anyway). 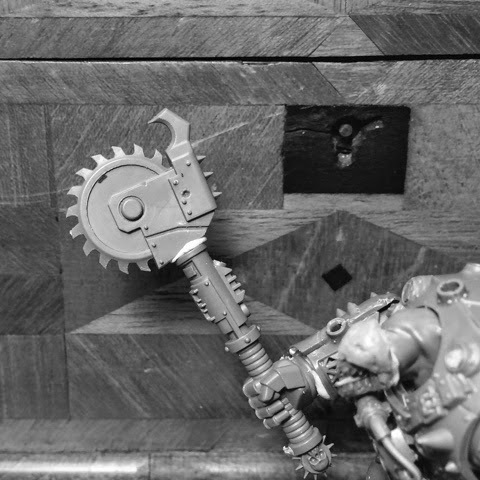 Armament is a rather hefty poweraxe made from the dreadknight hammer. What do you think about this configuration dear readers? Oh, if anybody has a spare dreadknight left fist I'd love to trade it for something from my rather extensive bitz box. - what am I saying - it'll look great whatever you do! More exotic weaponry would look awesome on this guy maybe look at some Cuthulu mythos art such as mii go technology for inspiration. Also agree that the head looks great and looking forward to seeing it with the cowl finished up. Yeah - the head works much better. As stated above I´m not too keen on bizarre weapons for this one though. This guy looks like a wrecking machine! I can imagine him playing bodyguard to some fat, pompous xenos slavetrader. Standing just behind a new client, smacking his clubsaw into an open hand and hoping the deal goes south so he can get a cheap meal out of it. :P I personally love the conversion and the use of a gaunt head is inspired. Xenos don't have to be exotically armed all the time and I can see this fellow not being the smartest tool in the shed. More of a point-in-the-right-direction-and-let-rip kind of guy. You hit the nail there, Jordan! 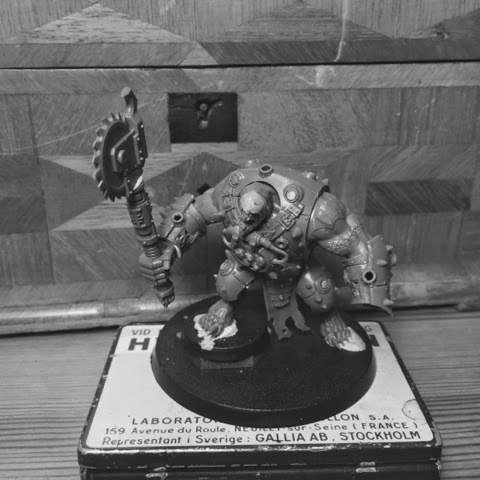 Forgive me if this has been asked before, but is the main body from the new skaven stormfiends? And if so, how do stormfiends compare to Dark Eldar grotesques or talos/cronos? I've been thinking of a few conversions to do with them myself. There´s a lenghty discussion about this in the previous post. Short version: Yep, stormfiend base. Too big for a grotesque, perfect size for an alternative talos. Nice start. Would gave him a bigger head. I think a Mournfang head would be looking very good and gave him a new alienesk look. Yeah that has to go. It´s just a mockup. Much better choice on the head, Its hard to put the Talos face mask on anything Talos sized and it not look like a Talos. I think the Buzzaxe is spot on. Do you plan on leaving the new head as is or doing more work around the neck? Not trying to step on toes but theres a lot of room on his shoulders/back that are screaming to me "Put some air tanks there with cables running into the back of his jaw!" This last bit is probably just nit picking and I'm sure with the quality of painting I know you are capable of can be fixed but I think the Dreadknight Gauntlets give off a more sophisticated look than the rest of the body. I know they are definitely the easiest route and could be toned down when painted, they just look too smooth and flawless compared to the rest of his stitched up body covered in "Rat metal". Just my 2 cents. Please don't take any of that to critically love the model and your work in general. As I said it´s just a mockup so there´s lot´s of work left. I´m pretty sure I can make dreadknight fit this body, don´t you worry. Thats brilliant! really nice look! looks a bit unpredictable, like he's about to go nuts at any minute! Have you thought abut maybe adding some sort of tracking device on him?, or even better, some chains and weights on his legs and arms! He certainly looks different from the last wip, the new head looks suitably alien and different from the norm. Have you considered making the chain axe into some form of chain staff for something more unusual? Weirdly when I look at the picture I imagine him with yellow or orange skin, have you had any thoughts towards a colour scheme? Colours will be decided upon when the build is ready. You'll have to wait and see. What about a forgefiend left hand for the empty arm? Wow, this is my first look on your blog, I am very impressed! I think it could be cool if you put some tanks and wires and stuff on his back. Plus, his head is awesome.